Still using a big, bulky, traditional power adapter to charge your lithium battery? 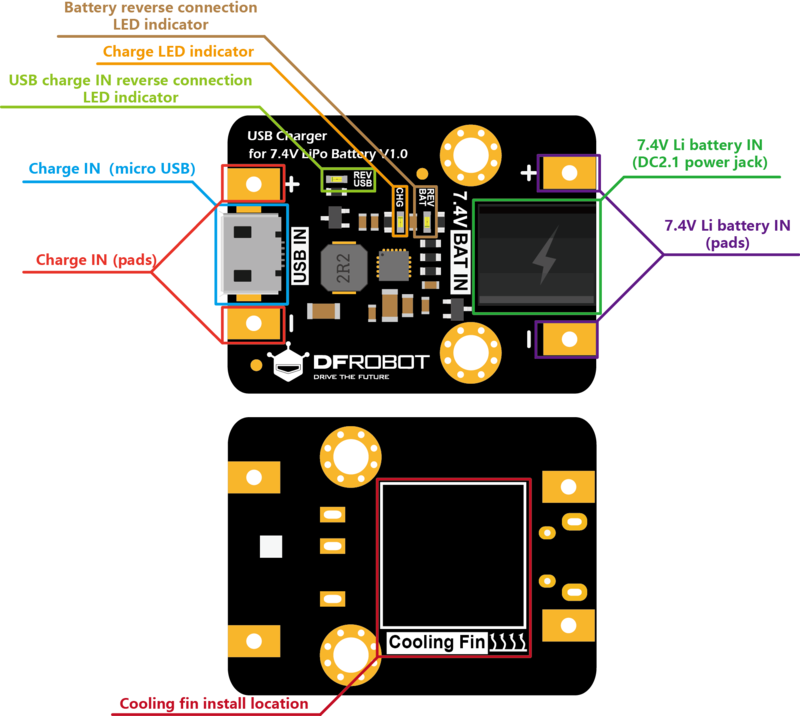 DFRobot provides you with a compact and efficient 7.4V lithium battery USB charger, only the size and weight of an ordinary Gravity sensor. With just a mobile phone AC adapter (or power bank) and an Android data cable, you can safely and efficiently charge the 7.4V lithium battery up to 1A, which commonly used in various robots and motor drivers. The light-weight and micro USB interface features make it ideal for outdoor applications. In addition to being a charger, it can also be embedded in a variety of 7.4V lithium battery-powered projects, adding a USB charging function to it, eliminating the need for battery swapping and the use of traditional bulky power adapters. Connect the mobile phone AC adapter or the power bank to the USB IN port via a USB cable. The CHG charge indicator (red) flashes rapidly indicating no battery being inserted. Connect a 7.4V lithium battery to the BAT IN port. CHG is always on indicating the battery being charging. After the charge is completed, CHG goes out. The module generates a certain amount of heat during normal charging, which causes the module to heat up. This is a normal phenomenon. Do not touch the components on the module during charging. If the module is used outdoors in hot weather or embedded in a robot with high power, the module will be in poor heat dissipation due to high ambient temperature. If the module is to work in such environment for a long time, in order to enhance the heat dissipation and prolong its service life, it is recommended to stick the attached blue thermal silica film on the cooling fin, and then attach it to the back of the module where it is labeled “Cooling Fin”. 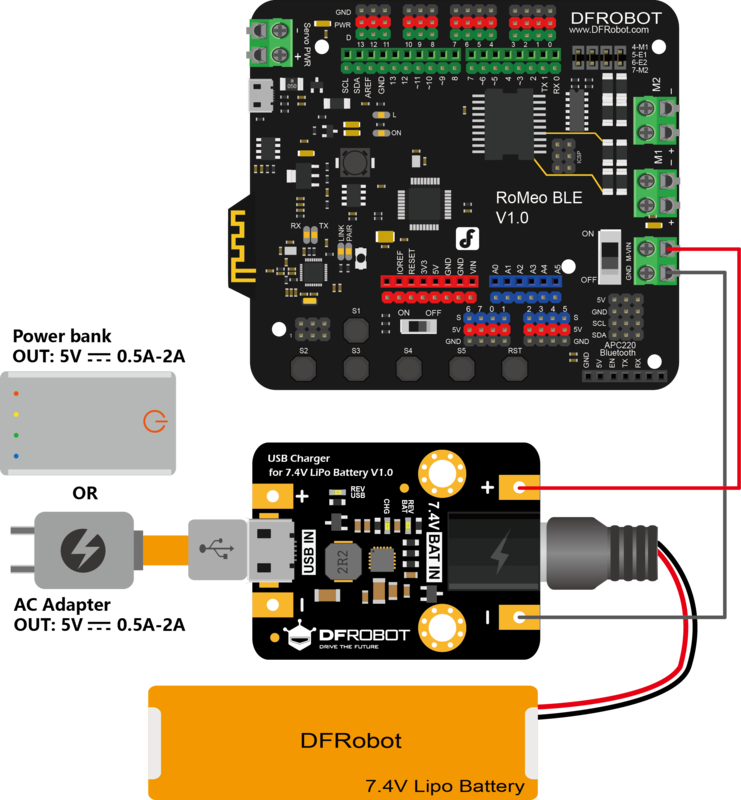 Users can choose to use DFRobot 7.4V lithium battery, or buy a 2s 7.4V lithium battery with battery protection circuit. Lithium battery manufacturers usually pack two identical 3.7V lithium batteries (usually lithium polymer batteries or 18650 lithium batteries) in series and a battery protection circuit. This module is unbalance charging type. It is not recommended to use 7.4V lithium batteries without battery protection circuits. Do not charge any two 3.7V lithium batteries in series by yourself. Otherwise, the batteries are probably overcharged, causing it to be damaged or even explode. The module has an adaptive current limiting function that automatically limits the charging current according to the load capacity of the external input power supply, which protects the power supply from overload. Regardless of the nominal power of the 5V power source, the module can safely and efficiently charge the lithium battery. Under normal circumstances, a 5V 1A AC adapter (or power bank) can provide more than 500mA charging current for the batteries, while a 5V 2A AC adapter (or charging treasure) can provide more than 700mA (up to 1A) of charging current for the batteries. The actual charging current and efficiency depends on load capacity of the power supply and the power loss of the cable. Low-power AC adapters and excessively long USB cable can easily trigger the current limiting function, which greatly reduces the charging current and, hence, prolongs the charging period. In order to make full use of the charging capacity of the module, it is recommended to use a high-quality 5V 2A mobile phone AC adapter (or power bank) and the shortest possible USB charging cable to reduce the power loss. Reverse connection indicators: When the BAT IN or USB IN is reversely connected, the corresponding anti-reverse protection circuit is activated and the reverse connection LEDs indicator (orange) REV BAT and REV USB turn ON, informing the user a connect error . When the USB IN is powered normally and the battery is not connected, the CHG indicator (red) blinks quickly to indicate that the battery has not been connected or is in poor contact. When the battery is fully charged, CHG goes out. When the following conditions occur, the CHG indicator flashes at a rate of about 1.3Hz, indicating that the module is in charge error and stops charging. USB IN is normally powered, but BAT IN is shorted. Input voltage of USB IN exceeds 6V. Charging time exceeds 6.5 hours. Add a 7.4V LiPo battery USB charge function to Romeo Romeo's motor drivers require additional power at the M-VIN port, which is usually powered by a 7.4V LiPo battery. After the battery is empty, you need to remove the battery and plug it in the dedicated 7.4V Lipo Battery Charger, and then plug it back in to Romeo after charging. Charging the battery in such way is somewhat troublesome. Here, we provide a more elegant way in charging battery, integrating the battery and the module with Romeo, leaving only a USB charging port. When the battery is used up, you can use the power bank to charge the battery through the micro USB port. Then benefits of using a power bank is that it is relative cheap and suitable for outdoor application, such as charging your robot when the power outlets are unavailable. 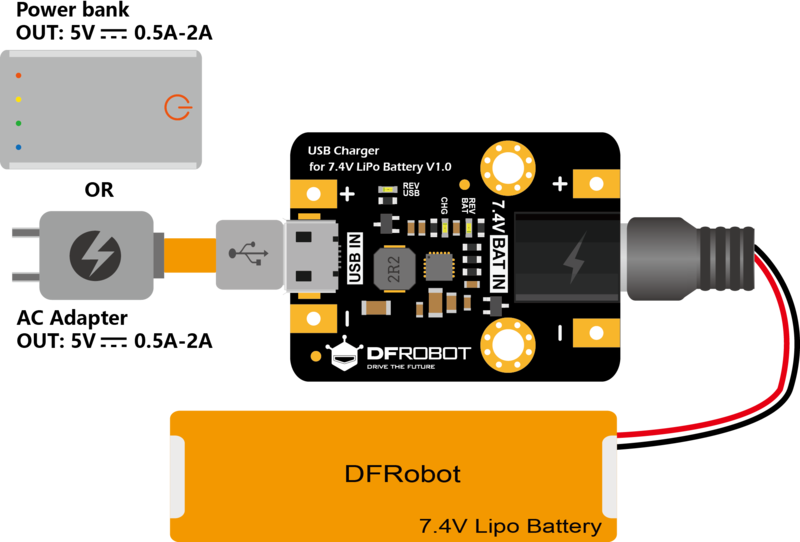 Get USB Charger for 7.4V LiPo Battery from DFRobot Store or DFRobot Distributor.